APOLLINARIS, (First Century), according to tradition, St. Apollinaris was a disciple of the St. Peter the Apostle (29th June), who consecrated him the first Bishop of Ravenna in Italy. He was also a noted wonderworker. 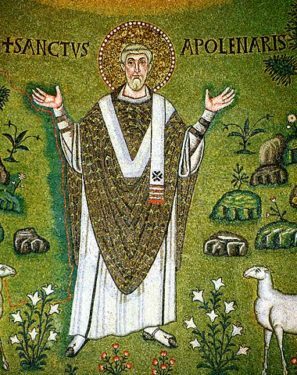 St. Apollinaris served the people of Ravenna for twenty-six years, all the while being subjected to many cruel tortures for his refusal to renounce Christ. St. Apollinaris was martyred circa 79 at Ravenna, his relics are enshrined at the Abbey of St. Apollinaris in Classe, just outside of Ravenna. APOLLONIUS and EUGENE, (Date Unknown), the metrical Calendar of Dijon mentions these two martyrs, who were sentenced to die for being Christians. St. Apollonius was tied to a stake, and he was then shot to death by arrows. St. Eugene is said to have dauntlessly placed his neck on the executionser’s block. No further information on these saints is extant. CONAN of CORNWALL, an early Bishop of Cornwall, St. Conan was appointed to the See by Æthelstan. From the limited information extant it appears he was consecrated sometime between July 924 and 932, though historian D. P. Kirby, is of the opinion that it is almost certain St. Conan was consecrated in 936. He served as bishop until his repose sometime between 946 or 953 and November 955. JOHN CASSIAN, following an extended time amongst the monks in the deserts of Egypt, where he received monastic tonsure, St. John travelled to Marseilles. While on his way to Marseilles, he spent time studying under St. John Chrysostum, who ordained him to the Diaconate. Once in Marseilles St. John established the Abbeys of St. Victor for men, and Saint-Sauveur for women. However, St. John is undoubtedly best remembered for his writings especially the Conferences and Institutes , which were highly praised by St. Benedict (11th July). There is some debate as to the year of St. John Cassian’s repose, ranging from 434-435 to 440-458. LIBORIOUS, the second Bishop of Le Mans from 348 until his repose circa 390. St. Liborious is the patron saint of Paderborn, Germany where his relics were translated 836, and enshrined in the Cathedral of SS. Maria, Liborius, and Kilian. RASYPHUS and RAVENNUS, (Fifth Century), natives of Britain who fled their country during the Anglo-Saxon invasions, settling in Normandy where they lived as anchorites. They were martyred in Macé, and their relics are enshrined in Bayeux. RASYPHUS, (Date Unknown), a martyr of whom nothing is known, but has been venerated in Rome since time immemorial. ROMULA, REDEMPTA, and HERUNDO, hermitesses in Rome. Their life of self-denial so affected Pope St. Gregory the Dialogist (3rd September) that he based one of his still extant sermons. SS. Romula, Redempta, and Herundo all reposed circa 580. TROPHIMUS and THEOPHILUS, two martyrs in Rome during the Diocletianic Persecution, circa 302. VALERIAN, a monk at Abbey of Our Lady of Lérins who served as Bishop of Cimeiz (part of present-day Nice France) in the middle of the fifth century. 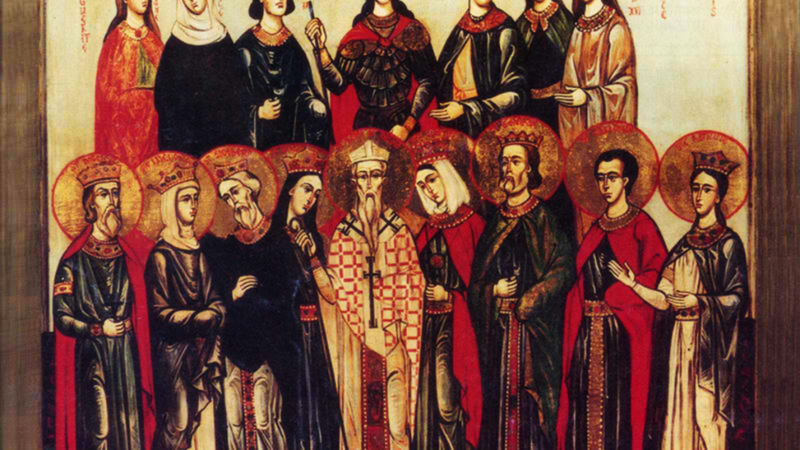 The exact dates are unknown, however, St. Valerian was in attendance at the Councils of Riez (439) and Vaison (442). St. Valerian reposed circa 460.